In case you hadn’t noticed, your friendly neighborhood Windows Phone Central gaming editor is a big fan of SEGA. While the publisher only operates at a fraction of the size it once did, it continues to produce numerous quality digital titles, plus a fair quantity of worthwhile retail releases. Last week, we gave the Xbox Windows Phone version of Sonic CD a well-deserved glowing review. 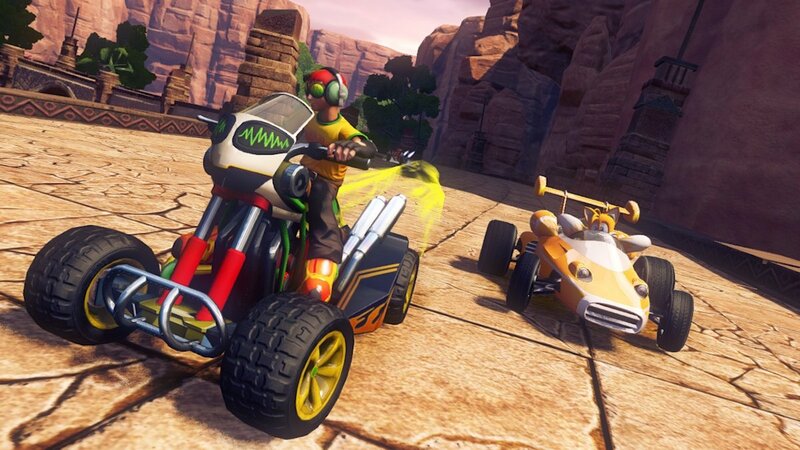 This week, we’ve got two mini reviews of SEGA’s latest Xbox 360 offerings: the retail release of Sonic & All-Stars Racing Transformed and Sega Vintage Collection: ToeJam & Earl for Xbox Live Arcade. Read on to learn about one of the best kart racers ever and a collection of unique Sega Genesis classics. Let’s shorten that unwieldy title to just Transformed from here on out. Transformed is the sequel to Sonic & SEGA All-Star Racing, a kart racer that critics didn’t seem to take much notice of. I don’t blame them for being wary. After all, mascot racers tend to turn out mediocre like Pac-man Kart Rally on Windows Phone. But the first All-Star Racing was actually one of the best kart racers in recent memory, and Transformed is even better. Besides its larger scope, the main innovation Transformed offers is the ability to race across land, sea, and air. Yes, this one single game combines kart, boat, and airplane racing. Many courses feature all three styles, in fact! Driving through the large transformation circles causes your vehicle to shift forms without slowing the game’s pace. 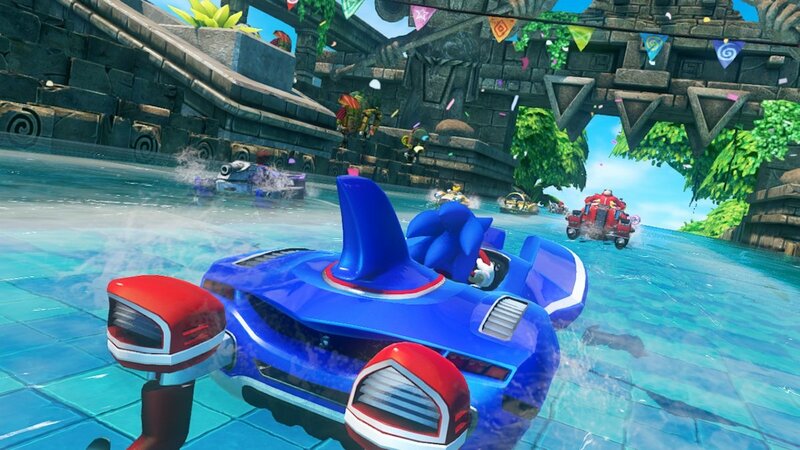 The water racing should remind players of Hydro Thunder GO, while the aerial racing really mixes things up with the added plane of movement. I found the aerial steering wonky at times, almost as if my plane was fighting wind resistance. Still, the variety of racing styles across a single track consistently thrills. Beyond the fresh gameplay, much of this sequel’s appeal stems from its copious fan service. First, the characters. 10 are unlocked from the beginning, including several from the Sonic and Super Monkey Ball series, Crazy Taxi, Space Channel 5, Jet Set Radio, and even Disney’s Wreck It Ralph film. By playing the World Tour Mode, you can unlock racers from Golden Axe, Shinobi, NiGHTS, Skies of Arkadia, and many other titles. It’s truly an amazing lineup. Each character has his or her own unique vehicle, All-Star transformation (a powered up form), and voice samples, too. No less impressive than the characters are the many tracks based around all those games. Remember how Crimson Dragon: Side Story is basically an unofficial sequel to Panzer Dragoon? Well, Transformed has a lovely Panzer Dragoon stage, complete with distinctive dragon flying around. The Skies of Arkadia stage also looks quite stunning with its gigantic airships and caverns to race through. Let’s hope the rumors of an XBLA rerelease of that awesome RPG prove true. Naturally, each level plays music from its respective game – one of the Sonic tracks even plays a new instrumental mix of ‘Sonic – You Can Do Anything,’ the Japanese title track from Sonic CD. Transformed has three single player modes, World Tour being the meatiest. Players will select events from a map, unlocking new events and pathways and they progress. On top of traditional races, you’ll encounter battle races in which you have to knock out other opponents, and various themed challenges. Early on, a Drift Challenge threatened to halt my progress. Nowhere in the game does it teach you to drift, as this sequel seems to assume we’ve all played the first game. That’s pretty much my only complaint; the difficulty skews towards experienced players instead of normal ones. Make more than a single mistake and you’re almost guaranteed to lose a race. Did developer Sumo Digital forget that a huge part of Sonic’s fan base are kids? Still, if an event proves too challenging (as a couple of them have for me), you can always drop the difficulty down to Easy for that event. You won’t earn as many stars for it (necessary to unlock characters and events), but at least you can keep on racing. While the single player portion of Transformed provides plenty of hours of fun (plus frustration if you go for the Expert Achievements), the multiplayer should also give the game ample replay value. We had a blast with four-player split-screen, which sacrifices a bit of visual detail but none of the excitement. The online multiplayer will put your Xbox Live Gold subscription to good use too. All told, Sonic & All-Stars Racing Transformed is easily one of the best kart racers of all time. The huge selection of characters and tracks will wow anyone who’s ever played a SEGA game, and educate the folks who haven’t. And every racing fan should appreciate the variety that land, air, and sea racing brings to the kart racing formula. If not for the sometimes annoying level of single-player challenge, Transformed would simply be the best kart racer ever. Still, at a retail price of $39.99, it remains a must-buy for anyone who cares for racing or SEGA in general. The ToeJam & Earl series is fondly remembered by people who played the Sega Genesis/Mega Drive. Sadly, the series remains largely forgotten by everyone else, despite ToeJam & Earl III appearing exclusively on the original Xbox. The cause may stem from SEGA not actually owning the characters, which belong to one of the series’ two creators, Greg Johnson. Thankfully he worked out a deal with SEGA, who have just released this collection of the two Genesis games. 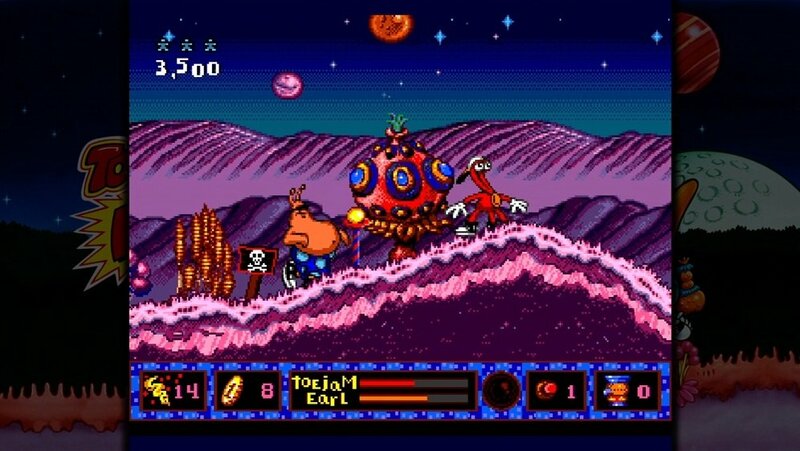 In the first ToeJam & Earl, the two alien protagonists have crash landed on Earth, damaging their spaceship in the process. Their goal is to find all 10 parts needed to repair it by scouring 25 bizarre levels. These levels can be randomly generated or fixed, depending on the players’ preference. Each level appears as a series of islands that float above the previous one; fall and you’ll end up on the level below. Just like the world we live in, right? Along the way, ToeJam and pal will discover numerous presents strewn across each map. These may contain helpful items like flight-giving wings, rocket shoes, a ducky float, and various edible delights. Or they could have poisonous food and items that actually kill you. The catch is, you won’t know until you’ve used an item for the first time or paid the walking carrot man (?!) to identify it. After that, the descriptions for subsequent presents of the same type appears in your inventory. Thus, experimentation plays a large role on top of the game’s heavy exploration. These elements are borrowed from the Rogue-like genre, though thankfully ToeJam & Earl is much easier (but still challenging). 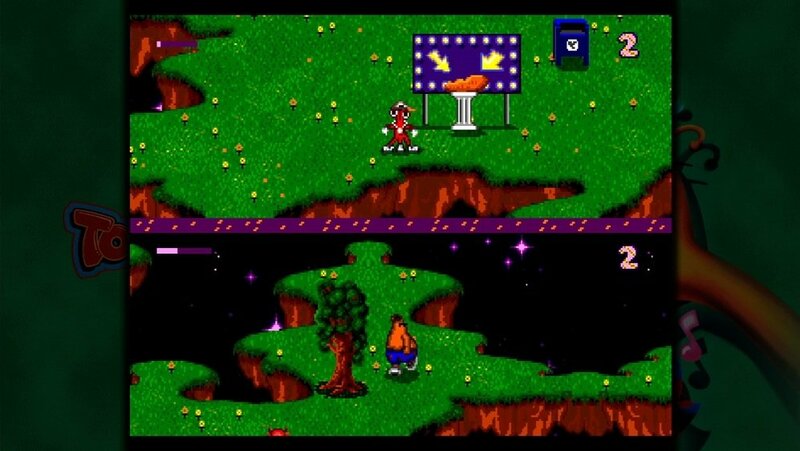 As if the unique gameplay and bizarre sense of humor didn’t help it stand out enough, ToeJam & Earl also packs a revolutionary feature for its time period: dynamic split-screen. When both players are in the same general area, the game appears as full screen. But walk away from each other and it switches to a horizontal split-screen display on the fly. It would’ve been nice for the switching to take place a bit faster in this rerelease, but it’s still an excellent feature regardless. 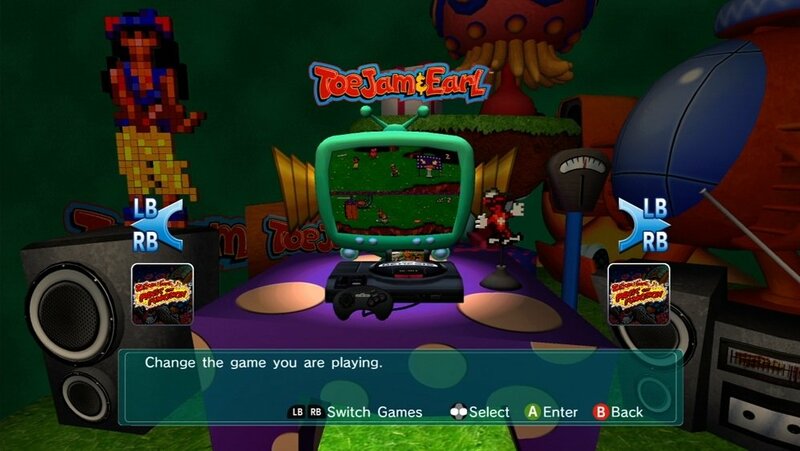 ToeJam & Earl 2: Panic on Funkotron takes place on the hip-hoppin’ aliens’ home planet. Dozens of pesky humans have stowed away on TJ & E’s ship, and now they’re bothering the locals to no end. It’s up to our funky heroes to bag them all and ship them home. A weird (and slightly mundane) plot, but what else would we expect from this silly series? The sequel mixes things up more than usual by switching genres. Instead of a Rogue-like, it’s a platformer. TJ & E can no longer split up; they are confined to a single screen. The contents of presents they find are still sort of randomized, but they’ll always be good, and they come in a much smaller variety. Basically, everything that made the first game special other than the humor and musical references has been excised. That said, ToeJam & Earl 2 is not a bad game. You get to run through its 17 levels solo or in co-op, hunting down obnoxious earthlings and trapping them in jars like they deserve. The characters are large and detailed (though lacking in animation frames), and the backgrounds boast plenty of sweet parallax scrolling. The controls and movement feel a bit off, like most American platformers from the time period, but they get the job done. Sega Vintage Collection: ToeJam & Earl has some nice extras you wouldn’t find in the original cartridges. These include beautiful 3D menus that recreate the Sega Genesis and several objects from the games, graphical options and filters, new widescreen borders, the ability to play the American or European ROMs, and more. The best additions are undoubtedly online multiplayer and save states. Unfortunately, only the first player gets Achievements, whether playing online or offline. But if you enjoyed the original games or just want a quirky game to play, this collection (especially the first game) is well worth the asking price. Sega Vintage Collection: ToeJam & Earl costs 800 Microsoft Points ($10) and you can find it here at Xbox.com. SEGA fans have three more XBLA games to look forward to tomorrow! 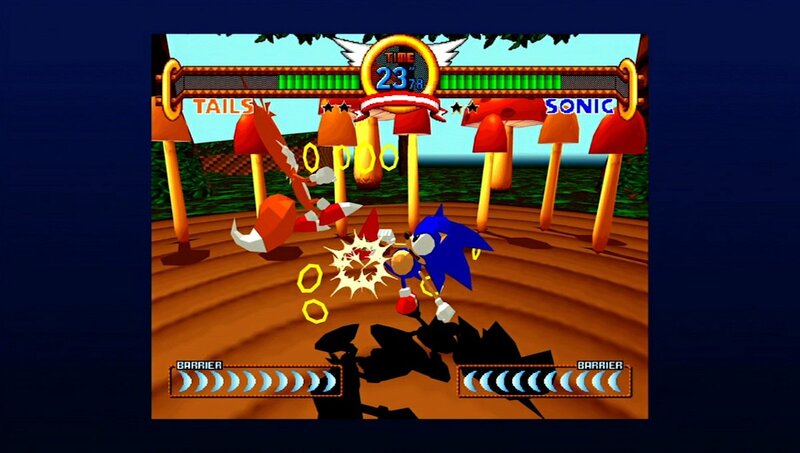 On Wednesday the 28th, Fighting Vipers, Sonic the Fighters, and Virtua Fighter 2 all launch at 400 MS Points ($5) apiece. We hope to have impressions of these classic arcade fighting games soon!